Faithful Departed—William F. Buckley Jr. I once told Bill Buckley that he’d played a huge role in the formation of my political thinking—as I’d been watching “Firing Line” since it appeared on PBS when I was 9 years old—and he said, “Well, that’s a frightening thought.” Of course, it was a frightening thought. Why was a 9-year-old watching a political debate show led by this devout intellectual with the vocabulary of a… well… the vocabulary typical of no one at any education level? Cause of my dad. My atheist dad. They were alike in many ways, and my father introduced me, through the TV screen, to Buckley. My father may have been against religion, but his ethical example, his dignity, and his love and respect for nature and his fellow man were spiritual practices if ever I’ve seen them. I know I got part of whatever religious core I have though him. And he and the author of “God & Man at Yale” shared many values. Bill Buckley is best known for starting the magazine National Review, and, largely through that publication, for leading a revitalization of conservative politics in America. But there has always been a tension within conservatism between what Buckley represented and what at one time called itself the “Know Nothings” — anti-intellectual, often anti-immigrant, populism. The conservatism William F. Buckley stood for was a heartfelt belief in individual liberty, collective responsibility and a healthy respect for traditions. His was not a politics of fear. It was a thoughtful and a decent politics. One that he was more than happy to defend against reasonable opponents. Buckley’s “Firing Line” was no relative of the modern split screen scream-fest, with surrogates of Left and Right speaking from memorized talking points, bullying their way to dominate the audio feed. On “Firing Line,” Buckley maintained a level of politeness that approached serenity. You finished watching an episode feeling edified, rather than feeling bolstered in an already-fixed position. And Buckley’s politeness was not the false platitude of a politician’s “my esteemed colleague”—he didn’t hesitate to let you know if he thought your idea was idiotic, but he never attacked your character. Your idea might be stupid, you might even be stupid in his eyes, but you weren’t evil. And it must be said: he clearly was having fun. One of Buckley’s trademarks was the twinkle in his eye. If there is one thing it might be fair for the Left to hate about Buckley, it is that twinkle. In his writing, his magazine, his TV show and in his person, Buckley made conservatism palatable by making it polite, and above all, friendly. Bill Buckley was playful. Buckley, and of course my former debating-team-captain father, shaped this ideal in me, which I’ve carried throughout my life. Whether a person is Left, Right or other, whether I agree or disagree with them, I expect discourse to be civil; and if it is not, I’m just not that interested. Son of an oil tycoon, Buckley, while no doubt an elitist, held the old-fashioned notion that the elite have responsibilities, that their privileged position requires gratitude (the title of one of his books) and service. In a more general way, Buckley’s Catholic faith informed his character, and so his politics, from top to bottom. In particular in three things: his respect for individual liberty rooted in the God-given inalienable rights upon which the United States is founded; his focus on service, responsibility and tradition; and his personal conduct, always gracious and always seeking Truth even if it worked against his selfish interests. Like me, Buckley loved Baroque music above all else. (Unlike me, he could also play it. He was an accomplished harpsichord player.) He probably winced, as I do, at many of the 18th to 20th century Protestant hymns. But aesthetics aside, I find a deeper truth in this. Buckley’s love for Bach especially — he once said, “If Bach is not in Heaven, I am not going!” — is based on the purity of the music: neither overly emotional nor overly complex, everything in its place and nothing superfluous. Bach’s transcendent beauty is in its Truth. In music, in politics and in faith, Buckley sought clarity, not complexity. A diligent shepherd of the Conservative Movement, Buckley strenuously opposed anti-Semitism, anti-intellectualism, Ayn Rand’s selfish objectivism, and, with an unfortunate delay, segregation. He squarely challenged thugs of all stripes, denouncing, among others, the influence on the right of the John Birch Society. And while his own moral compass was true, this sometimes put him at odds with the movement he created. Unless you understood the mixture of libertarianism and traditionalism that formed his ideology, his positions sometimes seemed odd, especially side by side: drug legalization and mandatory national service, McCarthyism and anti-racism. My father passed under George H.W. Bush. For better or worse, William F. Buckley lived to see his cherished conservative movement lose its bearings. He wrote before his death that unquestioning support for the Iraq War would be its downfall. Perhaps waiting until after his father’s death, Buckley’s son Christopher, in leaving National Review and the Republican Party, said the anti-intellectual populists had regained control. As I mourn the passing of one of my few personal heroes, I pray for a restoration in the times ahead of the kind of civility he and my father personified. 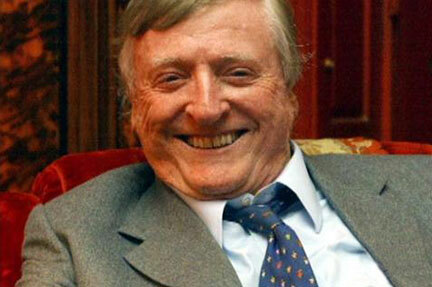 William F. Buckley Jr., 82, died, fittingly, writing at his desk. Our country is collapsing because we have turned our back on God (Psalm 9:17) and refused to kiss His Son (Psalm 2). Perhaps someday there will be a lefty commentator with a similar respect, civility, and twinkle in his eye for his opposites.